One person’s trash is often another person’s treasure. This is why finding items to buy used is one of the best practices to get in the habit of, both for your wallet and for the environment. 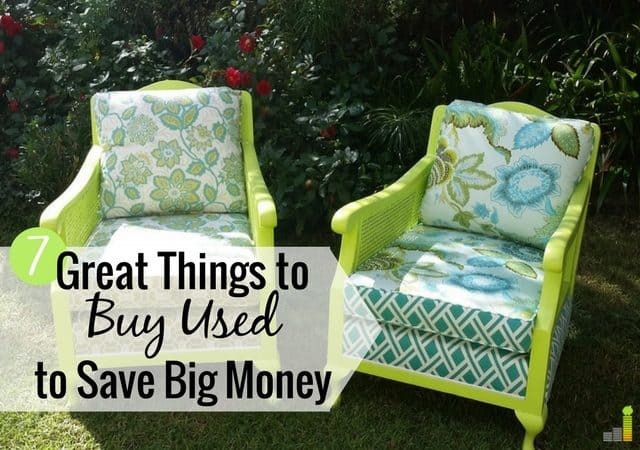 Purchasing everything brand new doesn’t always put your money to good use when you could be saving tens, hundreds, or even thousands of dollars by going with resale items instead. Are you looking to save that type of money and put it toward other expenses and goals instead? Here are seven things to buy used, every chance you get. I don’t think I’ll ever buy a brand new car unless I become a multimillionaire and meet every other financial goal I have. Even then, I still may be able to find something better to do with my money. A car is a huge depreciating asset. From the moment you start driving it, it loses value and becomes “used” anyway, which is why financing makes little sense – especially if you’re able to buy a car with cash. I like buying used cars because it saves money and it’s often a better deal overall. Some people argue that buying a new car means you won’t have to risk not having the latest safety features and can enjoy low mileage while getting more use out of the vehicle. It’s important to realize that you can probably get those same safety features on a car that is 2-5 years old, still score the low mileage and spend thousands less overall. I don’t need heated windows or shiny hub-caps and if you feel the same, you can buy all your cars used and save a killing over the course of your life. 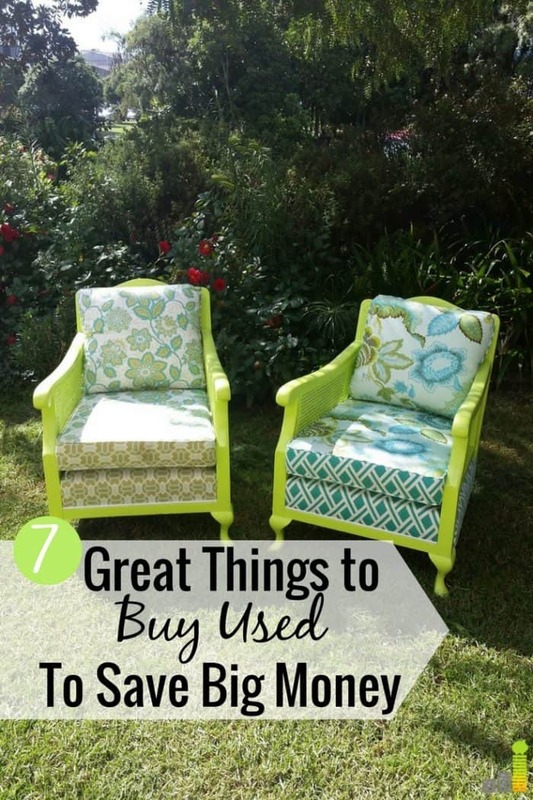 Furniture is another one of those great items to buy used. I draw the line at used mattresses, but for everything else I need, I will look at used options first before I go to a discount furniture store. In my early 20s, I financed a couch and it became one of the worst money mistakes I’ve ever made. Thanks to interest, I ended up spending $1,500 on a $500 sofa that I can barely fit on today. I thought I was building my credit at the time but now realize it’s much better to use credit cards wisely to build my credit because it helps me have a revolving credit line. Financing furniture is not worth it due to the amount of interest you’ll pay over the life of the loan. Even if you receive a low or 0% interest rate, you have to consider the fact that the price of the item could be heavily marked up anyway. To avoid this and save yourself some cash, check out resale stores, Craigslist, or even the Facebook marketplace, which is where I plan to get most of our furniture from when we move. I love buying used clothes. It’s one of the best things to buy used because it’s cheaper and for the most part, people have no idea (and could probably care less) about whether your clothing is new or used. If you like specific brands, you can find them marked down at certain retail shops like Plato’s Closet and Clothes Mentor. You can also shop online for used items on sites like ThredUp. If you’d rather not buy used, Amazon and Kohl’s are greats option to find new clothing at a great price. Garage sales and local thrift shops are other great places to look. Tools are excellent items to buy used. Things like hammers, wrenches, saws, shovels etc. can be great to have, but pricey when you’re trying to stock up on the proper tools for house and personal projects. Renting tools can be a waste of money too. It makes no sense to spend a ton of money on tools that you’ll only use once or once in a while. If you can’t borrow the tools you need, see if you can buy them used at resale shops or on Craigslist. You can also find deals for new tools on Amazon Warehouse. The tools are new, but have been returned to Amazon and are priced at a steep discount. Many people don’t buy movies now that it’s easy to download or stream them. We’re kind of old school and still buy movies occasionally to add to our collection. However, since we’d rather not pay full price, we go to resale stores, buy, sell, and trade shops to find used electronics, or on sites like SecondSpin, Decluttr or Gamestop. The same goes with video games, which are my son’s new obsession. I recently learned that we have to buy the physical games even though it will just be downloaded onto the system. The system itself cost enough and the games can be as high as $60+ new. You can pay half that when you wait a few months and buy the games used instead. It’s often a given that any item from your favorite brand can be bought used for much cheaper than retail price. I’m not too loyal to brands, but I do appreciate quality and realize that it’s not the best idea to buy everything generic. You may think you’re getting a bargain by buying something new that’s on sale or on the clearance rack. But in the grand scheme of things, you could end up spending more money if you skimp on quality. If you like iPhones for example, you can purchase a used iPhone and possibly save a $100+. If you like the quality of Levi jeans, you can buy them used at a fraction of the regular cost. Brand name items are often pricey, but you can find a loophole when you seek out gently used items from your favorite brands. Small appliances can be great items to buy used so long as you check to make sure the item is still in working condition. I’ve purchased, toasters, waffle makers and crock pots used for only a few bucks. Cheap plastic coffee pots might not last, but you may be able to find a quality one at a resale shop. I’m not sure if fans count as appliances but I’ve purchased those used too in the summer. If you’re shopping online, it will be easy to verify that the item is usable but if you’re at a local shop, be sure to ask to test the item before buying it. Employees are supposed to test items before listing them for sale in the store but can easily miss something. If you’d rather buy online, this is another instance where Amazon Warehouse can be a great option to save money on an appliance. If you want to cut expenses and save more money this year, one of the easiest things you can do is start shopping for used items to fill more of your wants and needs. Start with these seven types of used items then expand to whatever you feel is comfortable. What types of items do you like to purchase used? What is one thing you feel you must buy new, regardless of the cost? How do you feel about buying used clothes to save money?